ShopKo is one of the largest retailers of apparel, footwear, and home and electronic appliances. Its stores have a section dealing with seasonal themes such as Americana, Father's Day, Gifts for Grads and Packers Gear. 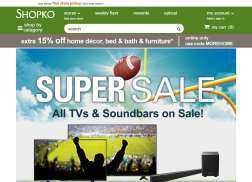 Customers review ShopKo favorably for its long-lasting products and amazing sales and discounts. Get Up to 60% Off Women’s tops and bottoms. Limited Time only! Get Up to 50% off Blankets and Throws. Buy More, Save More! Get $20 Off $100 or more, $35 Off $150 or more, & $55 Off $200 or more + Free Shipping. Valid Online Only. Get Up to 40% off Curtains.